This year we had 90 players in our extended category course championships. We added two age protected categories. A senior category for men over 50 in both the Open and Amateur categories. We had perfect light winds and a warm day that led to some great scores in all five categories. Clint Calvin who is our new course champion shot what is now a new course record for our modern course championship format. About 10 years back we changed our format to include an incredibly difficult second round that only the players in this event will ever play due to its’ difficulty and crossing fairways, Clint bested the 21 person Open field shooting a -11 on the medium difficult course, a -5 on the long course, a -15 on the short course and a -8 in the final 9. His -39 is the best score yet with this format and earned him $400 for his efforts. Rounding out the top four Nick Newton wowed the crowd with a near ace on hole 8 for his bid at the first ever -10 in a nine hole final. He eventually missed his putt on hole 9 as well to finish -8 for the final nine as did Clint. Max Nichols finished third again this year. Being a lefty Max is always fighting an uphill battle on this course. Coming in fourth was one of our longest playing champion players Carlo Pelg. Carlo has won the Course championship once but he’s finished second 13 times. Of note in the third round hard charging Carlos Caballero also a former course champion had two aces in his round. He nabbed hole 11a and hole 16b for the ace pool monies. That was one very high energy group to follow. Mike Westerman won the senior open division with a fine -12 in the third round outlasting near daily local Fred Aguero. In the Am category Alex Gerlock aced hole 12 long for the first time ever in tourney play earning him a dollar from each of the other competitors in the event. He then went on to win this 55 player category shooting a -11 for his three rounds, For his efforts he won a new sharpshooter basket from Legacy Discs plus an additional $200 in merchandise and shop credit. There were 18 players in the amateur division that cashed. In the Am Seniors Hans Degner led from start to finish carding an eventual -8 for the tourney . The seven man senior division had 3 who cashed. John Maki took second and Seamus Garland took third. In the women’s category Rianne Hamilton dominated again this year winning by 26 strokes in the four person field. Rianne shot a magnificent -8 in the third round. Second place finisher Pam Vaughn also shot an under par round carding a 56 in the third round. This year’s Spring Fling went off as well as any Spring Fling we’ve ever run here. We had 8 different PDGA Amateur categories this year. There was one ace in the tournament. Junior player Kai Barrios skip aced hole 17 for his first ever ace. Fortunately, his mother caught the once in a lifetime magical moment on video. Kai was one happy young man walking around after the tourney with a fist full of dollars from the other players and staff keeping up the age-old tradition of giving an ace recipient a dollar for their efforts. This year had several first-time winners. Ozzie Fausto won Advanced. He shot a two round cumulative score of -15 to edge out first round leader Charlie Grenis. David Neria survived a three way play off in Intermediate for his first win. Matt Tregidga is so happy to now officially be kicked out of Novice division as he outlasted the 21 player Novice field by a stroke. 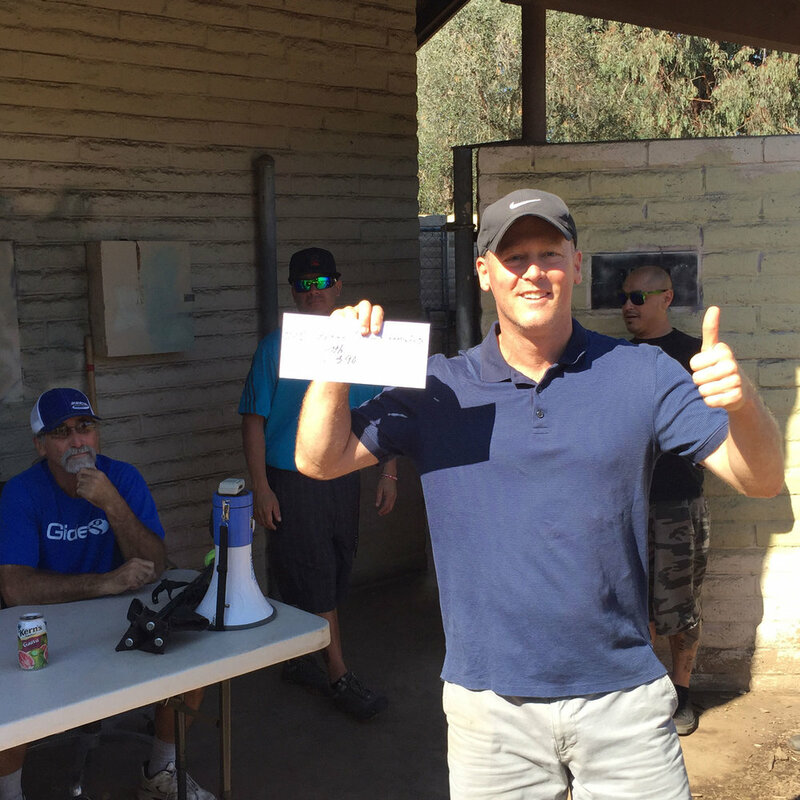 Quinny Kravitz having shot the best first round of the tournament at -8 earned his first PDGA Masters victory. Eric Ducharme having suffered thru multiple 2nd place finishes topped last year’s winner Hans Degner for his first Grand Masters victory here at Morley. We added a Senior Grandmaster division this year and John Maki the wily local veteran bested first round leader Pete Hembrow who played Morley the first day the course was ever put in way way back in 1977. In the Women’s division Rianne Hamiliton not surprisingly won for her third straight year. And finally, 12 year old Disc Golf phenom Xaelen Nash crushed his field shooting a -5 with 8 birdies in his second round to once again win the Junior Division. Xaelen has set several Junior world distance records as he’s grown up. He birdied both long 5 and hole 6 back to back in the afternoon winds this tourney. His final score was actually one stroke better than the 22 person Intermediate field. Somebody should warn Ricky and Paul. Xaelen’s coming! This year’s included lunch was provided by my son’s restaurant Amplified Ale Works. It was a real treat for the players who were upgraded from the usual Costco pizza. Our sponsors this year were Innova Disc Golf, Discraft, Dynamic Distribution, Gateway, Legacy and MVP discs. 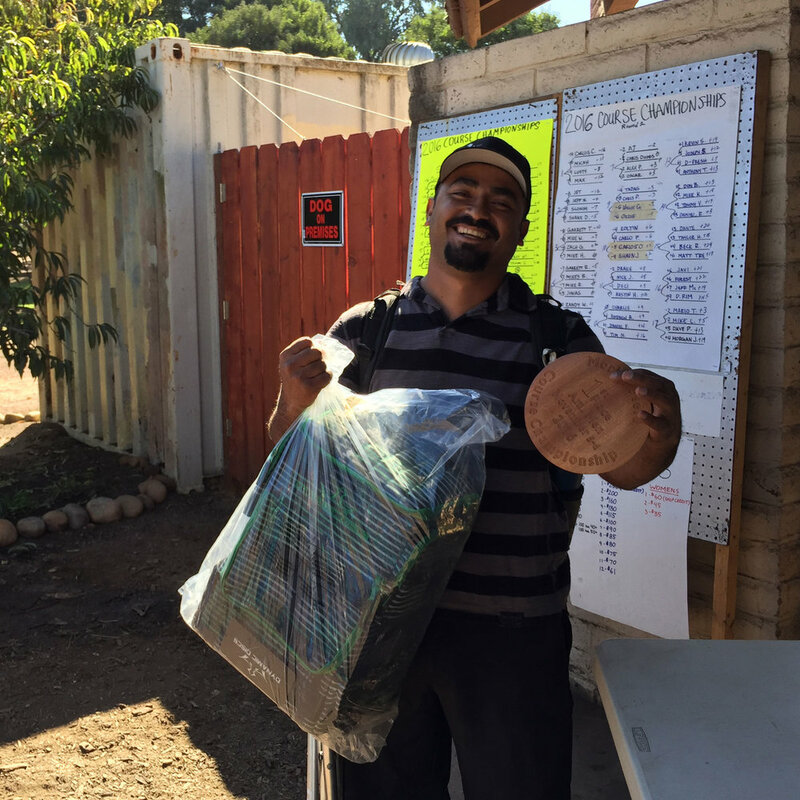 All of whom donated hats and clothing for the free drawing and discs for the player prize packages. I owe a big thank you to my staff which included my son Alex who will be running this event going forward, my wife Joanne, EJ, Eric (who flew in just to help out with this event), Oscar, Jesse (PDGA data and morleyfield.com updates), and all my regular staff in the shop. A special thank you goes out to Zac Burnside who as a volunteer handles both computer graphics, art coordination and gets our screenprinting done as well. Also a special thanks to Chris Dilloway for artwork and general handiman skills in making this event run as smooth as silk for the players. 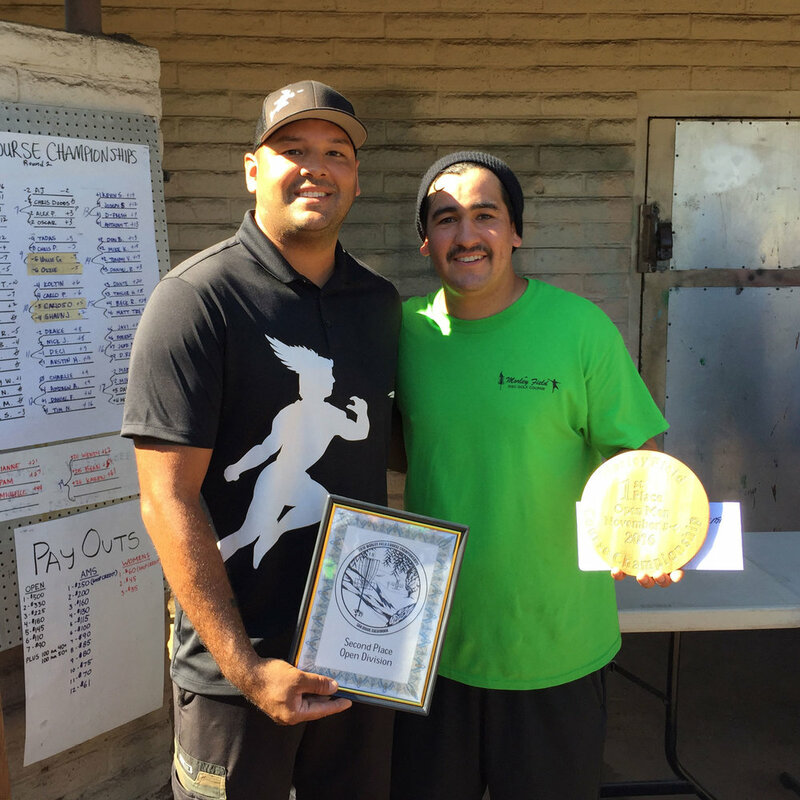 This was my last official PDGA tournament till I retire at the end of this year. I owe a big thanks to all the tournament participants this year who made running this tourney amazingly fun for me as well. I had a blast this year. We have some special juniors coming up. The future looks bright for Disc Golf. This tournament always begins on the Friday afternoon preceding the start of Saturday’s match play at the putting contest. $300 is up for grabs with $100 going to the winner. The rest is split up between the top 5 in the finals. Over the year’s the wily veterans have learned to hold back from entering the prelims until just before the cut off time of 4 p.m. when the finals are set to begin. They accomplish two things by doing this. One the wind usually calms down later in the day and two it becomes obvious how far you’ll need to go on the prelim stations to get into the top five who make the finals. Greg Barsby waited till the last minute then entered knowing no one had hit the putt from all nine stations. He then preceded to run the table and claim the $100 first prize without even having to putt in the finals. San Diego’s own AJ Risley took second, Nate Sexton third, Randy Saab our perennial fourth place finisher took his usual spot and Steve Rico finished 5th having left before the final shoot out. off well beating the number one and two seeds in the first two matches. They finished day one tied for the lead with a four and one record. Day two saw Team SD lose their first match of the day to their co leaders Redwood Empire then beat Huntington Beach to go 5-2 for the tourney. Team Oregon won both their matches on Sunday to go 5-2 . 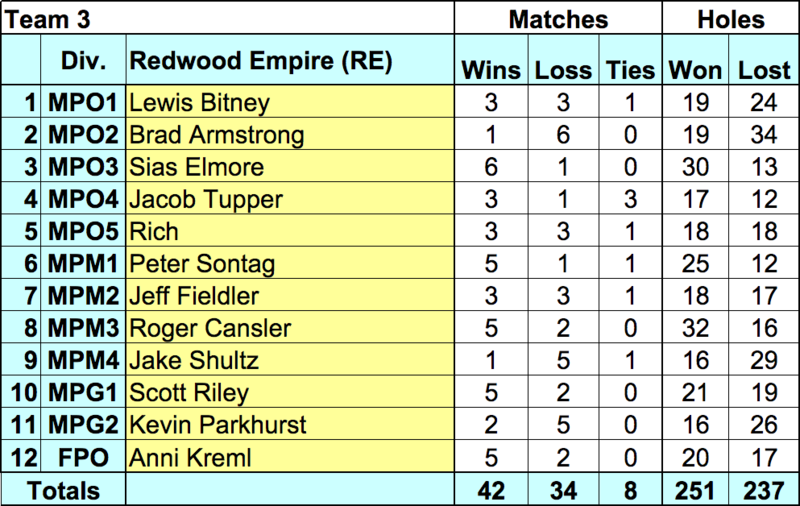 Also finishing 5-2 was Redwood Empire. Head to head each co-leader team beat one of the other two teams making it go to the second tie breaker of points differential. Oregon had more points in the three matches between the co-leaders giving them first place. Second place is then determined by head to head play whereby Team RE got second having beaten SD in the prelims. Team Oregon went on to win in the finals for the second year in a row. They also won the Spirit of the Event award for the second year in a row by a unanimous decision of the staff. These guys did everything together (although I never checked on their sleeping arrangements:). They all entered the putting contest together. They practiced before the tourney as a team they even came to the tourney party as a team. Their unwavering support for each other was their ultimate source of strength and a big reason why they win. Of course having Nate Sexton, Nate Doss and Valerie Jenkins on your team is a pretty good start as well. The sweet part was all the great memories over the 36 years this event’s been held here. Jim Tobish did the math. We’ve played over 300,000 competitive holes here and thrown close to a million throws in this tournament. This is a one of a kind match play team event. It’s like having 7 little tournaments in one. Each 12 hole match is against another player at your same position on a different team. Many of the players who attend this event have been coming back year after year. At least two players from out of town have been here at least 32 times. Nearly 50% of this year’s players have been here at least 15 times. This has been a major west coast Frisbee family reunion since it’s 1982 beginning. Weather for the tourney this year was absolutely perfect both days. After predictions the week before that it would be raining all weekend this was a very pleasant surprise. Lunch was provided again this year by Amplified Ale Works and was delicious as always. Some of this year’s sponsors went way over board with their free drawing donations knowing this was the last one. Sam Ferrans from Innova gave us Discatcher baskets, Super hero bags, and zippered hoodies as well as the usual great plastic. MVP also gave us a Black Hole practice basket. We ran a couple of mondo’s to give away the baskets. Thankfully Matt Jankowski won a basket by hitting two 60 ft. putts in a row. This was a reasonable consolation for his spectacular match play performance. Matt finished with the top record 6-1 for San Diego. His only loss to the much more experienced Team HB captain Chris Brophy in their final match of the tourney. Also of note our woman, Rianne Hamilton went 5-2 losing only to 4 time World Champion Val Jenkins and Lesli Todd this year’s runner up in the Women’s Masters World Championships. Also an awesome performance. This Course Championship was unexpectedly the largest in our 41 year history. 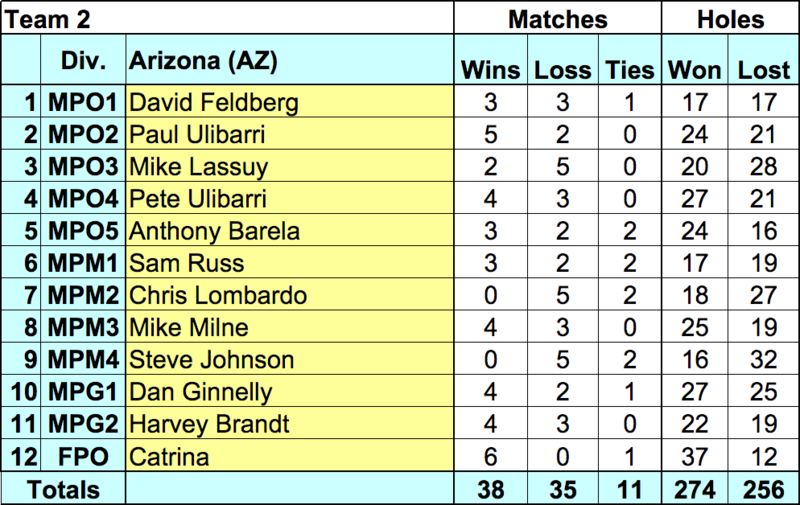 With 30 players entering in the last couple days there were 91 total entrants this year. Out enjoying the perfect weather on a closed course were 37 Open players, 6 women and 48 amateurs. As we’ve done the last couple of years we offered the players three totally different layouts in this event. First round was a normal, medium difficultly layout. Second round is always talked about all year as everything is long. We even play long pads on 8,9 and 17. Several pin placements are only used for this specific event as they are too dangerous for the general public to play on. The third round is all short. Easiest course we can put up. To give you an example of the difference many players shot 15 or more strokes better in the third round than the second. One old seasoned veteran Dan Shorkey improved 23 strokes in his third round over his second round. Our open winner was no surprise. Seppo Paju staying here in San Diego while visiting his girlfriends parents had just finished his pro tour for this year. He is a 1027 rated player from Finland and finished 6th in the USDGC this year to end his season on very high note. Our locals gave him a good run for his money with perennial second place finisher (14 times) Carlo Pelg only one stroke behind before going into the final nine. Seppo wowed the crowd of approximately 100 spectators when he chose to throw a 100 foot high “staker” over the tops of the trees on hole two and tombstoned into the ground just a few feet short of the pin to the roar of the crowd. Last year’s course champion Carlos Caballero finished a very solid third with this year’s shop representative Clint Calvin rounding out the top four in the final nine. Clint also gave the crowd a thrill by drilling a 100 foot jump putt downhill on hole three for a birdie. Also notable was Carlo Pelg’s deuce on long 6 on the hillside next to Jacaranda Dr. (don’t look for this pin position on the tee sign) and Seppo’s drop in deuce on long 16 (talk about a horken hyser). The women’s division also had a very close contest with reigning course champion Rianne Hamilton pulling away with a -3 in the third round to win for the second year in a row. Second this year was Allie Robles (I hear she’s due in March) with third going to Kimmy Cottrell. The Am division was also highly contested with Travis Thomas playing a very steady game to pull out a three stroke victory over the ever smiling Willie Grenis. Willie shot an Am division best -10 in the third round to jump over Quinn Henry and Hunter Mannix who finished third and fourth respectively. The top finishing Master aged individual was Carlo Pelg and the top finishing Grandmaster aged player was Ed Speakman. Both players received automatic invitations to the upcoming Team Tourney for their excellent play in their age division. This tourney was sponsored this year by Sean Powell and flydisc.com. 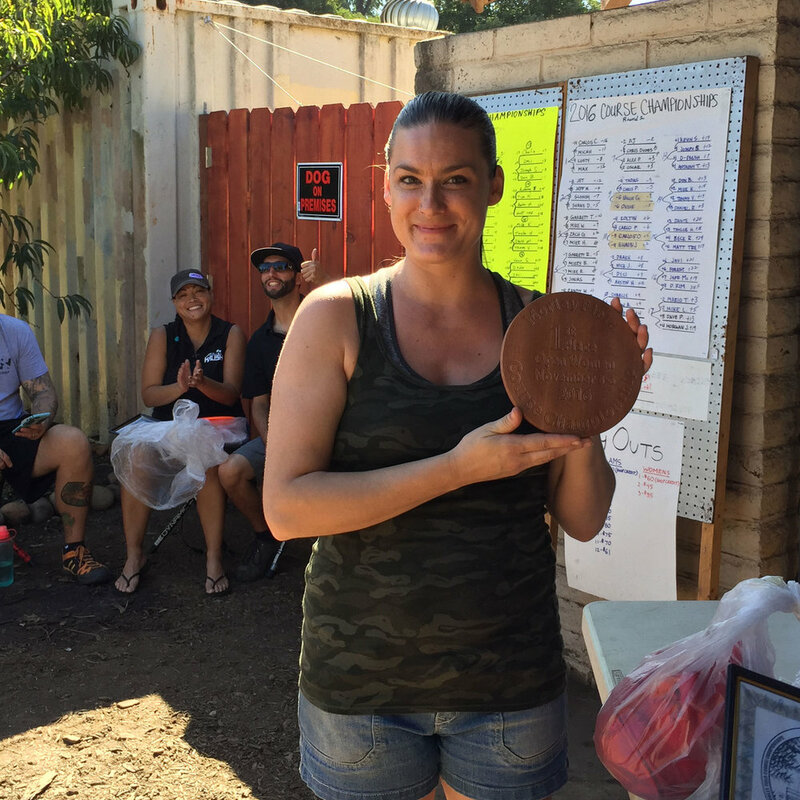 Sean gave all the winners a one of a kind custom disc with the tourney artwork He also gave out 8 coupons for designing your own custom disc to the winner of each category, plus the top three open players, the grandmaster winner and the Master winner. This is a very cool website where you upload your own custom artwork and create a one of a kind disc for yourself. Other sponsors were George Spraklen’s custom wood trophies and Amplified Aleworks provided the players with salad to go with their pizza for lunch. As usual a big thanks goes out to all my staff for all their hard work as well to my wife, Mac (for the last 30+years), Charlie Grenis, Woody and Greg Olsen. Click here for event page which will be updated with results. Clarion Hotel in National City (7 minutes drive time) is our official hotel for this year our 35th annual. We've reserved 20 rooms (17 double double 3 King) at $81 per night but that includes hot breakfast Saturday and Sunday. I've asked them to open breakfast early at 6:30 since we have a 8:00 a.m. tee off both days. The team makeup is the same as last year: 5 open, 4 masters, 2 grands and one woman. The schedule otherwise will remain the same as in the past. We will have our $300 putting contest on Friday afternoon at 2:00 p.m. Finals at 4 p.m.
Huntington Beach and Arizona will be responsible for scorecards in the first 4 rounds. Then Huntington Beach and Oak Grove will be responsible for scorecards for the rest of the tourney. After lunch on Saturday we will send out cards with Huntington Beach, Arizona and Oak Grove. There will be no break after round 4 at 3 p.m. We will go directly into round 5. 4 teams will go back and play the same 12 holes they just finished Oak Grove, Santa Cruz, Arizona and Redwood Empire. The other 4 teams continue on their same progression thru the course. The reason for no break is the course this year plays a little tougher than in the past due to lots of tree and bush growth tightening up routes along with several new pin positions. Play will likely be slower than in the past. I will give each captain 12 hole assignment sheets. One for each of your 1 thru 12 players so there will be no reason to get lost or wonder what hole you start on just follow the instructions. Just make sure the right numbered sheet gets to the corresponding player. Sheet 1 to player 1 and sheet 12 to player 12 (this addition is probably long over due). On Sunday, "Spirit of the Event" award will proceed finals. Free drawing will follow finals before awards. Win two Open division Morley Monthlies in the current year having shot a two round cumulative round of -20 or better. Win three Open division Morley Monthlies in the current year. Win an Open position in the year end grinder competition. Winner of the Course Championship Amateur is qualified for grinder play. All other competitors must be San Diego County based open division players only. Win a GM position in the year end grinder. Winner of the current years course championship if not a PDGA Women’s pro player will receive highest consideration and will be eligible to compete against selected PDGA Women’s Pro candidates. This division is the most problematic to pick a candidate since we have so few women competing. Any interested women should make their desires known to anyone in the pro shop and we will try to arrange a Women’s grinder if necessary. This year’s team tourney ran smooth as silk right on time and the weather cooperated perfectly. Several dozen people showed up on Friday before the tourney putting contest to get autographs from some of the disc golf luminaries. They weren’t disappointed. This year’s tourney saw the return of 4 time world champion Paul McBeth after a 4 year hiatus from this event. He led the Huntington Beach team to their second win ever in the 35 year history of this event held each year the first weekend in December here at Morley. McBeast punctuated their victory by throwing and ace on hole 13 in the finals while throttling the Steve Rico lead team from Sylmar. Sylmar won the prelims 6-1 beating Huntington Beach 7.5-4.5. Huntington Beach after a slow start won both their Sunday morning matches and secured the second seed with a 5-2 record going into the finals. They then carried their momentum into the finals beating Sylmar 9.5-2.5. Team San Diego had an off year. Several long time members were unable to play this year and the team had its’ worst showing ever. Finishing next to last in the eight team event with a 2-5 record in the prelims. 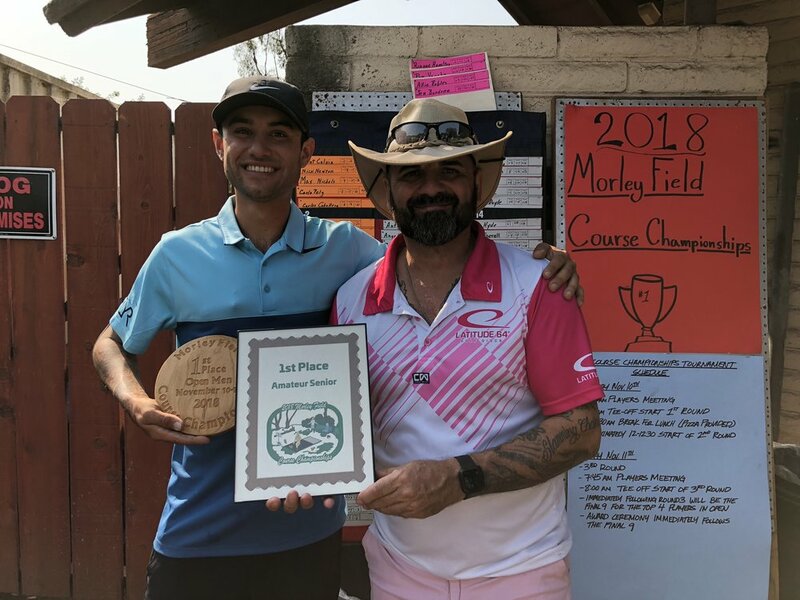 On a positive note for team San Diego rookie member Jonathan Maki, Am winner of the Spring Fling and long time team pro member Mike Slonim both had a marvelous 5-1-1 record to lead the beleaguered locals. This event is a marathon of disc golf on Saturday with each player playing 5 matches and completing 60 competitive holes between 8 a.m. and 5 p.m. Lunch is provided at the noon break each year by Amplified Aleworks formerly known as Cali Kebab. Players nosh on chicken, lamb, pita bread and falafels along with salad while recounting the shoulda, woulda, coulda’s of their morning matches. Innova Champion, Discraft, Dynamic Distribution, Gateway, Legacy and Millennium again donated discs and free drawing swag for the players. The winning team gets $250 per player a nice custom plaque from NP Trophies and 5 discs per player. Second place gets $120 and 3 discs per player. The team captain keeps the big perpetual trophy and adds their name to the plaque. 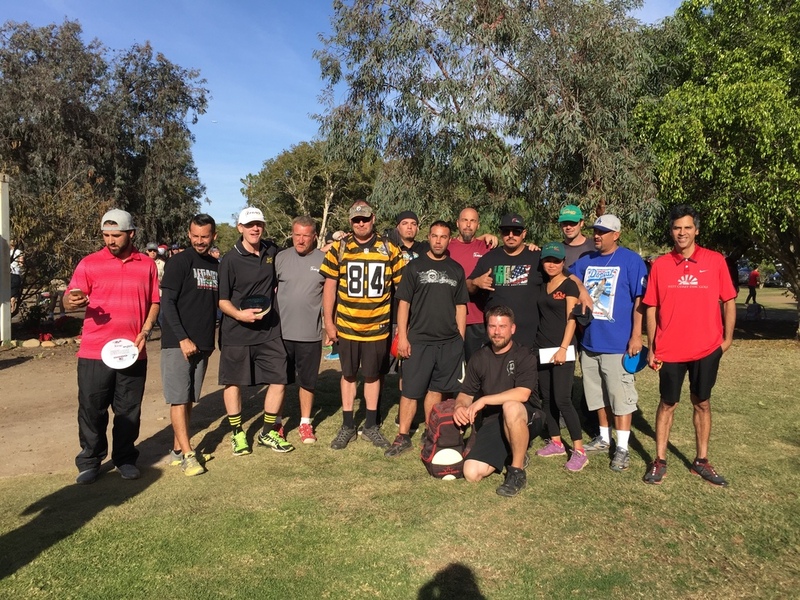 Finally, The Spirit of the Event trophy went to Team Oak Grove for the first time ever plus they received 5 discs per team member. Big thanks to all the staff: Mac, EJ, Jesse, My wife Joanne, Tommy, Mike, Mitch, Tyler, Chet, Garrett, Angel and of course Scooby. Special thanks to Chris Dilloway who provided the art this year and played on the team as well. Thanks to Central Coast Disc Golf for filming at the 2015 Southwestern Team Disc Golf Invitational and catching some great action like this Ace by Paul McBeth on Hole #13.